"Words are heavy, they're like stones. If birds could talk they couldn't fly." One of my favorite quotes from one of my favorite TV shows, Northern Exposure, came to mind while experiencing Love Person at Park Square Theatre. After premiering at Mixed Blood Theatre in 2008, Aditi Kapil's bilingual play has seen success around the country, and now returns home in this new production, which she also directs. It's a play about the heaviness of words, and how sometimes they beautifully convey feelings, and other times they fall miserably short. Performed in both English and ASL, with a little Sanskrit thrown in for good measure, the play explores the ideas of language, communication, relationships, love, and family. It's a play that requires focus and effort from the audience (you will be reading surtitles during complete silence at times), but that effort pays off in this engaging, poignant, funny, thought-provoking, moving story. The four characters who inhabit this world are sisters Free (Canae Weiss, both the character and actor are deaf) and Vic (Elizabeth Efteland), Free's lover (or love person, the literal translation of the ASL term for it) Maggie (Erin Anderson Gardner), and Vic's potential new boyfriend Ram (Imran Sheikh), a Sanskrit scholar. 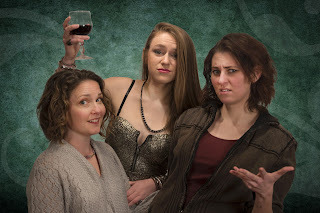 The four characters all struggle to communicate with each other, as they go through changes in their lives and relationships. I don't want to tell you too much about what happens, other than that it's quite compelling to watch these relationships grow or struggle as they hit familiar obstacles. Three of the characters speak in ASL at some level, and the character of Maggie frequently translates from English to ASL or vice versa. At other times surtitles above the stage translate ASL or English into written text. Besides English, Sanskrit, and ASL, another language used liberally in the play is the language of text and email, a very modern language that seems to be replacing spoken language, and has its own strengths and weaknesses. These texts and emails are displayed above the stage as characters type to each other on opposite sides of the stage. This is where the effort comes in; it can be difficult to stay engaged when there's complete silence in the room and little action on stage (or at least it seemed to be for the chatty people sitting behind me). But in this world of over-stimulation, with sounds constantly coming at us from our TVs, radios, devices, and even at the gas pump, it's quite refreshing to absorb the silence and just focus on the words. It also perhaps gives us some insight into the deaf experience, devoid of audible sounds but rich in other ways. I'm really loving what seems to be a recent trend of incorporating ASL into theater (see also Ten Thousand Things' Dear World and the Deaf West production of Spring Awakening on Broadway). This is not merely translating into ASL, as most theaters do once or twice during the run of a show, but using ASL as another storytelling tool. Even for those of us who don't understand the exact meaning of the signs, it adds another dimension to the emotions being conveyed by the characters. And more importantly, it offers more inclusion and representation to expand the audience. Michael Hoover's clever and versatile set design splits the stage in two, with the all important streetlight in the middle. One side is the couple's apartment, the other is Vic's bedroom, with curtains sometimes lowered to hide both and allow for other settings in front of them. And importantly, there is plenty of space above the set for surtitles and emails to be projected, with differing fonts for the different people speaking (projection design by Adam Raine). This is one of those plays that got me thinking. Isn't all language a translation? A translation of thoughts, ideas, and emotions into words, which are sometimes inadequate to express said thoughts, ideas, and emotions. But that's why we have theater, and music, and other art forms, as another tool of expression when words fail. Love Person beautifully expresses thoughts, ideas, and emotions in many languages, spoken and unspoken (continuing on Park Square's main stage through April 10). 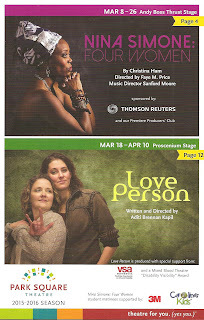 *Read my thoughts on the other play on the cover of the playbill, Nina Simone: Four Women, here.